Emilie Porcher is a young Frenchwoman originally from the Loire Valley who came to study in Bordeaux. Like many before her, she was smitten with the place and has decided to stay. In order to celebrate her 30th birthday, Emilie invited some friends over to share wines from her birth year, 1985 – a very good one in Bordeaux. I do not like taking notes at social occasions, and even less at table, so here is an overview of what we drank. There were two sweet wines for the aperitif: a 2002 Gewurtztraminer vendanges tardives from Clos Saint Landelin and a 2005 Rayne Vigneau, first growth Sauternes. I must confess to not usually liking Gewurtz, finding it frequently too aromatic and never knowing beforehand how sweet it will be (a frequent issue with Alsace…). This wine, however, was not over the top. It had a fairly deep bronze and golden-amber color and a delicate white fruit nose (pear, gooseberry, jujube) with hints of rose petal. Some botrytis was evident as well as candied fruit overtones. The wine was quite sweet and smooth on the palate – the sort I enjoy in small quantity. The Sauternes, 10 years old, had a medium deep color. The bouquet was honeyed, but a little one-dimensional. The wine showed better on the palate, with good acidity. The best part of the taste profile was the finish, which has that attractive bitterness that serves as a foil to the sweetness of the best Sauternes. This can be enjoyed now, but will hold. The first wine at table was not served blind. This was a 2013 Odé d’Aydie, from Pacherenc du Vic Bihl, the white wine made in the Madiran region (60% Petit Manseng and 40% Gros Manseng). This had a nose reminiscent of Sauvignon Blanc and decided grapefruit aromas. The citrus component continued onto the palate, which was rather average. The wine was just too sharp for me. The first red wine was poured blind. I hesitated for some time as to which side of the river it was from, and incorrectly plumped for the Left Bank. Perhaps I can be forgiven because it turned out to be an 85 Cheval Blanc which, as we all know, has a high proportion of Cabernet (Franc). I should have known better since there was a definite emyreumatic note…. Anyway, the wine looked quite old and had a very tertiary nose of lead, tobacco, cherry, and sweet pepper. It was fully resolved on the palate and is still quite tannic on the finish. The bottle we shared of this outstanding wine was a little tired, but still a great treat. The second red wine of the meal was 1985 Léoville Las Cases. I have had this wine before on several occasions, but guessed it was a Latour. 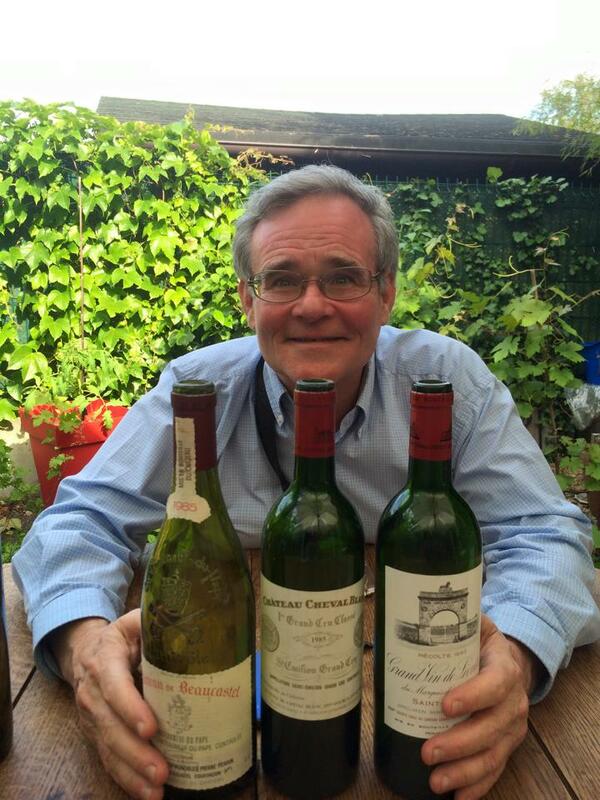 In fact, one whiff sent me to Pauillac… The LLC was more vibrant than the Cheval, but also considerably evolved. It is a subtle wine with good acidity and a long, velvety aftertaste. I think it is past its best, but still a wonderful pleasure. The last red wine was an 85 Beaucastel, Châteauneuf-du-Pape. This seemed oldest of all, and quite faded, but a wine to sip on slowly, gratefully, and meditatively at the end of the meal. Posted in Uncategorized and tagged Bordeaux, Cheval Blanc, Pauillac on June 21, 2015 by AlexR.